Irfaan has been with Open Box for over 10 years and has been involved in some way in the majority of clients and projects we have worked on. His solid technical grounding along with his calm demeanour and level head has contributed to the success of our delivery over the years. 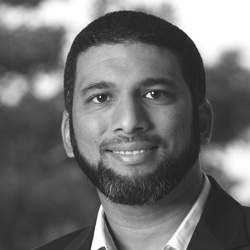 Irfaan has a joint role as Director of Enterprise Solutions as well as Chief Information Officer. As CIO, he steers the direction of our critical internal systems and processes, ensuring that we derive the best value out of our investment in IT. As the Director of Enterprise Solutions he relies on his strong delivery record to ensure that the systems we implement and the support we provide always exceeds expectations. In his spare time, Irfaan can be caught on the other side of the lens, snapping away on his collection of cameras.